Congratulations Karen Cesare, President of Novak Environmental, Inc., RLA, ASLA! 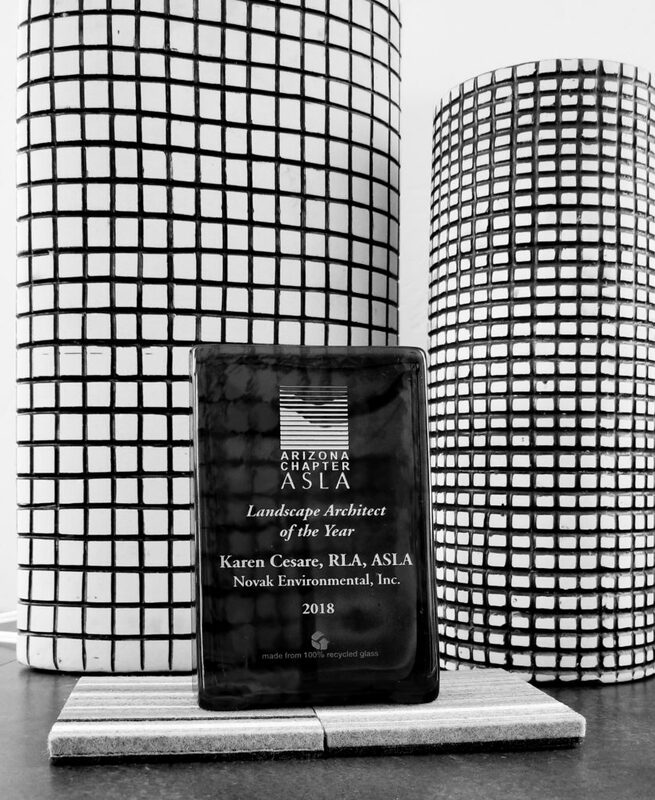 – Novak Environmental, Inc.
Novak Environmental, Inc. would like the congratulate our own President and Owner Karen Cesare, RLA, ASLA. This year, Karen was awarded by the Arizona Chapter of the American Society of Landscape Architects (AZASLA) as the Landscape Architect of the Year! The Landscape Architect of the Year award is intended to recognize professional landscape architects who show remarkable leadership in community service, education, design, and service to the profession. Exemplary leadership in design, education, and service to the community and the profession certainly describes Karen Cesare, RLA, ASLA. Karen Cesare is the President of Novak Environmental, Inc. which just received an Award of Excellence for design of the Crane Lake Relocation Project (http://www.azasla.org/award-winners/crane-lake-relocation-the-linchpin-project/). Karen has organized AZASLA sponsorship and participated as an event supervisor for the last 5 years in Landscape Architecture oriented events for the regional and state Science Olympiad competition. In these events, students challenge their STEM skills while learning about professions like Landscape Architecture. Karen has also taken trips to Phoenix and helped in many ways efforts by the AZASLA to defend licensure for Landscape Architecture in Arizona. These efforts are to ensure that landscape architecture practice in the state is of the highest quality and holds the health, safety, and welfare of the public in tantamount importance. Finally, Karen Cesare is an elected board member for the Central Arizona Project (CAP), which helps to ensure access to reliable and sustainable water in Arizona. As a native of Arizona, Karen is keenly aware of the challenges associated with management of water in the west, and takes great pleasure in her ability to represent the people and communities of Arizona to help ensure water in perpetuity. Congratulations Karen Cesare on being awarded the Landscape Architect of the year!